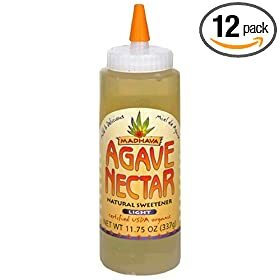 has anybody uses agave nectar in a recipe before?? ?i made a beer (recipe follows)and unfortunately agave is not an option in the calculator.if you did use it,what were your results?? it has been fermenting vigorously for 6 days with no sign of slowing.for some reason i did not check o.g. so i don't have that exact info. Last edited by candleman on Thu May 15, 2008 1:15 am, edited 2 times in total. I would be interested in founding out how the high fructose levels in agave nectar would convert into alcohol in fermentation. It sounds like a very interesting additive. i read about it in my brewing book and it is listed as 'experimental'. oh and it is not very cheap. I haven't tried it but from what I hear it ferments out pretty light and dry. You might not notice it except for the additional dryness it will add. One day I'm going to try to make pre-tequilla by fermenting just some agave syrup & water. Might be good if I can get it to freeze and then use it in blender margaritas. akueck wrote: I haven't tried it but from what I hear it ferments out pretty light and dry. You might not notice it except for the additional dryness it will add. the light agave ale came out great.a nice dry ale with an interesting flavor.not too alcoholic.i think i may make it again this summer with no changes,since i actually enjoy it. 1.0 oz. Nugget (Whole, 12.50 %AA) boiled 60 min. 0.50 oz. Sterling (Whole, 5.90 %AA) boiled 15 min. 0.50 oz. Crystal (Whole, 3.50 %AA) boiled 2 min. Wow, sounds great. I may have to try that recipe soon! Glad it turned out good. Here's a good question, What food would it go good with? you mean there are foods that don't go with beer? I wouldn't think so but a chocolate bar is hard to eat with an IPA. That's all I know, the rest should work. quit braggin about your off the wall concoctions. jimcraig wrote: quit braggin about your off the wall concoctions. can you buy that stuff in tennessee? I think I might be able to. How did it come out? i have a new beer every week. although i have made that recipe 3 times so far,and just bought another set of ingredients to make it again.